Powered via its USB 2.0 interface, PicoScope 2202(TM) PC scope adapter features plug-and-play operation for any laptop or desktop PC running Microsoft Windows 98SE or above. Dual channel, USB oscilloscope has 20 MS/s, 8-bit sampling rate; 2 MHz bandwidth; ranges from Â±50 mV to Â±20 V; and 32 kB buffer memory. 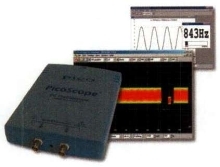 Supplied with PicoScope and PicoLog DAQ software, users get simultaneous oscilloscope, spectrum analyzer, and multimeter functions. New USB-Adaptor Turns PCs into Fast Scopes!